Eiteljorg Museum announces LDI, Ltd. as presenting sponsor of Steel Ponies. This generous support, funded by the LDI 100th Anniversary Celebration Cultural Partnership Gift Program, will help the Eiteljorg sustain strategic efforts to reach out to new audiences. Over the past three years, the Eiteljorg has been on an amazing trajectory, attracting new and more diverse visitors. The Eiteljorg Museum is proud to announce LDI, Ltd. as presenting sponsor of the five- month exhibition, Steel Ponies. This generous support, funded by the LDI 100th Anniversary Celebration Cultural Partnership Gift Program, will help the Eiteljorg sustain strategic efforts to reach out to new audiences, which have already resulted in a 40 percent increase in attendance and a doubling of ticket revenue for the institution. “We are honored by this extraordinary commitment,” says John Vanausdall, president and CEO of the Eiteljorg Museum. “And we are happy to partner with LDI in growing Indianapolis’ already vibrant cultural offerings and making them accessible to more people than ever before,”. Steel Ponies, which opens March 10, presents the finest examples of motorcycles—from vintage cycles and famous Hollywood bikes to tricked-out custom jobs, and explores how they relate to the real and imagined American West and Native America. 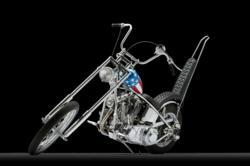 The exhibit features the motorcycle Evel Knievel used in many of his famous jumps; the “Captain America” bike, used in the counterculture classic film, “Easy Rider;” and more than 20 other must-see motorcycles. The exhibit provides a compelling and unique opportunity to advance priorities embraced by both the Eiteljorg and LDI, including attracting diverse audiences, families and regional audiences to experience Indianapolis’ cultural offerings. The LDI gift makes possible expanded exhibition programming, including an exploration of women riders, who are too often ignored. The Steel Ponies calendar includes a presentation by Cristine Sommer-Simmons, who road cross-country to re-create the historic ride of Effie Hotchkiss, who in 1915 became the first female motorcyclist to ride coast-to-coast. Families who visit the exhibit will also have a chance to “meet” Adeline Van Buren, who also made a transcontinental motorcycle journey, in the Steel Ponies gallery. The addition of a costumed interpreter will help guests of all ages become immersed in the history of motorcycles and the American West. In addition, a unique partnership with the Miracle Ride will help draw visitors from across Indiana and beyond to the Eiteljorg Museum. The annual motorcycle ride, benefitting Riley Hospital for Children, attracts thousands of riders to the Indianapolis area. The Eiteljorg will be a stop for participants in the Ride’s popular Poker Runs and all Miracle Riders will be offered free admission to the Steel Ponies exhibit. The Eiteljorg Museum of American Indians and Western Art seeks to inspire an appreciation and understanding of the art, history and cultures of the American West and the indigenous peoples of North America. The museum, which opened in 1989, is located in Downtown Indianapolis’ White River State Park. For general information about the museum and to learn more about exhibits and events, call (317) 636-WEST (9378) or visit http://www.eiteljorg.org.